We have some answers regarding regarding the pictures we posted a couple of weeks ago. 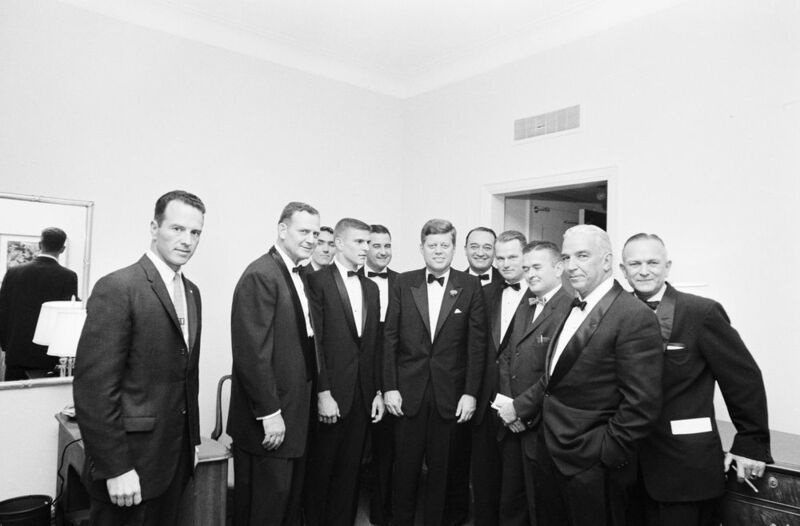 Football Hall of Fame Dinner in New York City December 5, 1961, Room 805, Waldorf Astoria Hotel, New York City. White House Army Signal Agency staff members Jack Rubley and John J. Cochran are on the far left and third from left, in back, respectively. Second from left is Alabama coach Paul “Bear” Bryant, Alabama QB Pat Trammell, University of Alabama President Dr. Frank Rose, the President, broadcaster Mel Allen, University of Alabama sports Hall of Famer Young Boozer, Birmingham News sports writer Benny Marshall, Tom Russell, Jeff Coleman. Information source is the Birmingham News. JFKWHP-ST-M7-7-61. Football Hall of Fame Dinner in New York City 5 December 1961. JFKWHP-ST-A21-1-61. 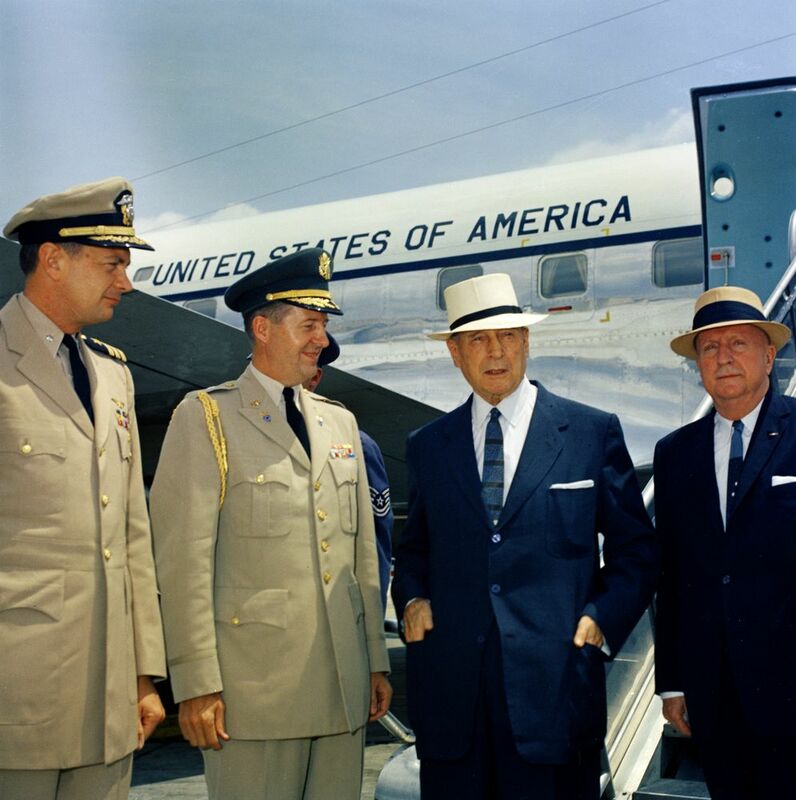 Tazewell Shepard, Chester Clifton, General Douglas MacArthur, and Major General Courtney Whitney, 20 July 1961. The man on the right is Major General Courtney Whitney, aide to General MacArthur. The location is probably Andrews Air Force Base. JFKWHP-KN-C17388. 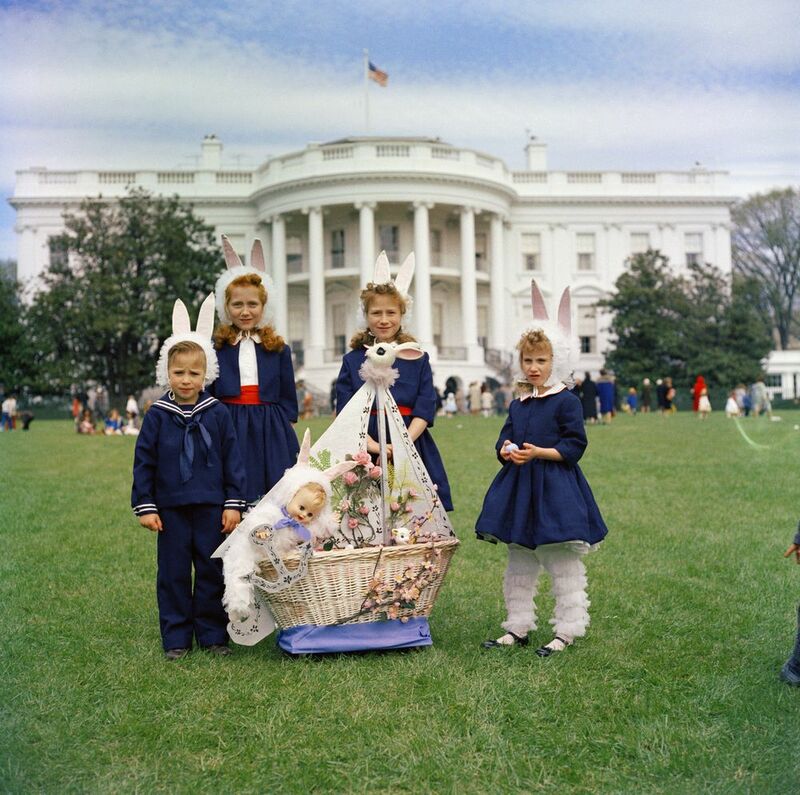 White House Easter Egg Roll, 3 April 1961. JFKWHP-KN-C19648. 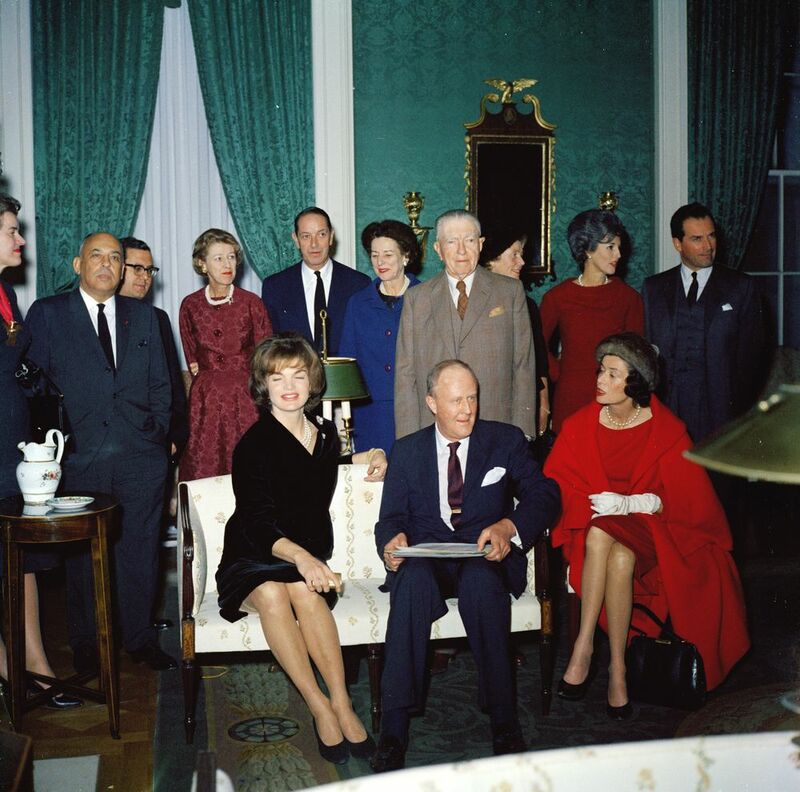 First Lady Jacqueline Kennedy’s Tea for the Special Committee for White House Paintings, 5 December 1961. The above event is First Lady Jacqueline Kennedy’s tea for the Special Committee for White House Paintings. Mrs. Kennedy and Chairman of the Paintings Committee, James W. Fosburgh, are sitting on the settee; all others are unidentified. The setting is the Green Room of the White House. Does anybody have names for these faces? One gracious commenter has told us the following: ” Seated left to right Mrs. Kennedy, Mr. James Fosburgh and Mrs. Joseph Alsop. Standing, left to right Mrs. Suzette M. Zurcher, Mr. Stanley Marcus, Mr. Lawrence Fleischmann, Mrs. James Fosburgh, Mr. Nathaniel Saltonstall, Mrs. J. Cheever, Mr. Henry Francis du Pont, Mrs. Walter Halle, Mrs. William Paley and Mr. Joseph Pulitzer, Jr.” Thank you! Regarding the image of Mrs. Kennedy’s Tea for the Special Committee for White House Paintings, the gentleman standing behind Mr. Fosburgh is Mr. Henry Francis du Pont. Mr. du Pont owned and created the magnificent Winterthur Museum in Wilmington, Delaware. He was also Chairman of the White House Fine Arts Committee. The gentleman standing at the far right of the second row is the actor, Vincent Price. Besides acting, Mr. Price was a noted collector of art. Thank you! Historical knowledge advances even further. I believe I can now identify all the individuals photographed at Mrs. Kennedy’s Tea for the Special Paintings Committee. Seated left to right Mrs. Kennedy, Mr. James Fosburgh and Mrs. Joseph Alsop. Standing, left to right Mrs. Suzette M. Zurcher, Mr. Stanley Marcus, Mr. Lawrence Fleischmann, Mrs. James Fosburgh, Mr. Nathaniel Saltonstall, Mrs. J. Cheever, Mr. Henry Francis du Pont, Mrs. Walter Halle, Mrs. William Paley and Mr. Joseph Pulitzer, Jr. (who I mistakenly identified as Vincent Price in a previous post). I am a docent at the Winterthur Museum. This picture is in the house library with other artifacts showcasing family achievements. Henry Francis duPont was Jackie’s chairman of the White House Restoration Committee. The picture is rather small and faded so only HFD and Jackie are noticeable. I am doing research on “The Lives and TImes of the Fabulous Cushing Sisters”: Babe Mortimer Paley, Betsey Roosevelt Whitney and Minnie Astor Fosburgh as I am presenting the book as my reading selection James Fosburgh was friends with HFD and I though he might also have another connection through the WHite House Decorative Arts Committee. What a fun surprise to see James seated next to Jackie with HFD behind them while Minnie Astor Fosburgh and sister Babe Mortimer Paley are standing in the third row! So glad this was a fun surprise for you! Wishing you the best of luck on your own research into the Cushing sisters!